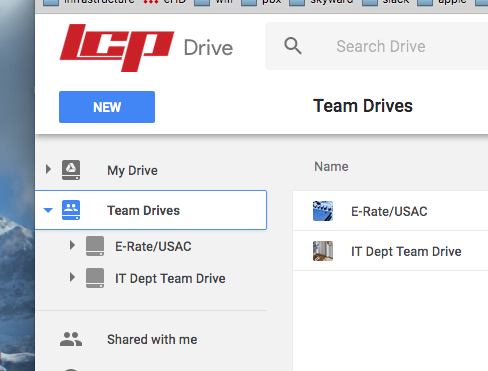 Team Drives are shared spaces for teams to store their files in Google Drive and guarantee that every member has the most up-to-date information, no matter the time or place. Team Drives files are owned by the team members (not an individual) and stay put exactly where they are even when a team member leaves the group or leaves LCISD. Team Drives have simple, understandable sharing rules. You can find content more easily, collaborate and share more confidently, and keep your team files safe. Team Drives is designed to centralize your department’s files. Team Drives eliminates the issues with individual owners! Designed to store the team’s work collectively, so if a document’s creator moves off the team or leaves LCISD, that document doesn’t go with them. Team members prevented from accidentally removing or deleting files that others need. Sharing rules in Team Drives provide a consistent view of content to all team members. Team Drives allow controls that prevent members from removing or accidentally deleting files. Click “Team Drives” on the left-hand side of the screen under “My Drive”. Click the blue “New Team Drive” button on the left-hand side of the screen to create a new Team Drive for you and your teammates. Add teammates and files to your Team Drive. Play around! Team Drives works very similar to My Drive.